Make no mistake as to the roots of this long-standing indie rock/alt-country band. Miss Ohio is a New Jersey-bred outfit that has been recording and playing live for nearly 15 years, at first as a four-piece consisting of Dave Wilson (guitar, vocals), Jim Kaznosky (guitar, vocals), Pietro Lorino (bass), and Brandon Loikits (drums), and more recently with the addition of Ed Roessler who has filled in on bass or guitar and is now a full-fledged member of the Rutgers-New Brunswick-born, Jersey City-located band. Entry into the standard beauty pageant may be out of question, but what Miss Ohio excels at is in capturing the ear with its moody to engaging indie rock to Americana tunes. Heartfelt vocals, bittersweet lyrics (and vice versa! 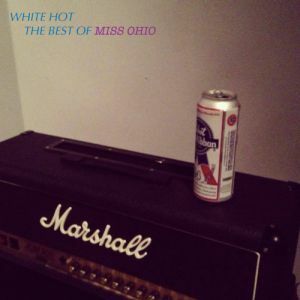 ), and a shimmering to energetic bedrock sound abounds on White Hot: The Best of Miss Ohio, the band’s latest album which collects signature tracks from its long run. Miss Ohio just dropped the number “14” to celebrate the release of White Hot via Pyrrhic Victory Recordings, and is also offering a limited edition lathe cut vinyl 7” of “14”. An agitated whirlwind of guitar distortion, smashed drums, and crashing cymbals soon follows, whipping Wilson’s downtrodden, J. Mascis-like introspection up into the sonic storm. He bemoans the inexorable passage of time as “our bodies decay” and “there’s nothing left to say.” “14” is American indie rock at its finest, combining transporting music with lyrical import.